Scoops Continues to Amaze . . .
Was coming down from Ventura county (from another foodventure, to-be-posted soon) on the 101, and got the sudden pang for ice cream. And so off the Normandie/Melrose exit and into Scoops I went. Again, I'm delivered a $2, two-flavor "scoop" of creamy, dreamy frosty goodness. Pear-pecan-gorgonzola ice cream with crisp, juicy sweetness were wonderful with the buttery pecans and the crumbles of tangy blue cheese; blueberry mascarpone, well, that just taste like cheesecake with fresh blueberry sauce & a la mode! I also tasted other flavors; all were fun to try but didn't really work for my tastebuds, including rosemary-crème fraîche, maple cappuccino and green tea vanilla. The brown bread this time wasn't as crack-addicting as I remembered. Nonetheless, I applaud Tai Kim for his frozen works of delight and look forward to future scoops at his shop. 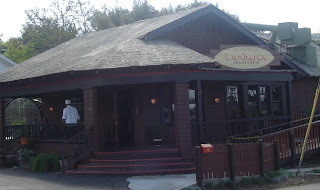 Months after saving up for the excursion, I finally had the chance to dine at the L.A. gem that is Providence. 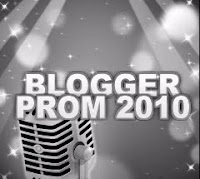 Having been awarded numerous culinary accolades (from being named one of America's tops by Gourmet magazine to being deemed the best of 2006 by the fickle Chowhounders,) I, of course, have high expectations for the place--but will such aspirations only let me down? As Kevin noted, Providence occupied a space formerly held by Patina. Under the direction of Michael Cimarusti (formerly of the Water Grill and Spago before that), Providence's menu is focused on usage of fresh, seasonal seafood combined with the L.A./Californian tradition of playful and eclectic creations. The atmosphere and vibe of Providence came to me as simply elegant, with striking light/dark contrasts between the walls, the floor and furniture, further accentuated with the room's lighting (mostly dim with various spotlights). The restaurant didn't waste space and time on needless props and decorations and I later understand why: the food is the centerpiece here, deserving of the complete attention of all five senses. After ordering, we were greeted with bread, butter and sea salt, good but unremarkable, and shortly after that, the two-course amuse. 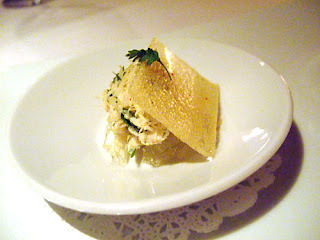 Part one: dungeness crab-stack with lemon jelly and parsnip flake. 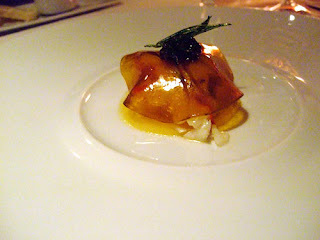 A wonderful flavor and texture combination, the firm and sweet crab meat played nicely against the tart jelly and the crisp flake. A definitely delight to the palate. 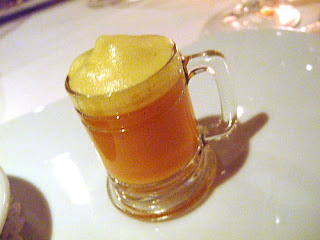 Part two: A small mug of carrot soup with curry foam. Also good, but less amusing, I like curry and I generally like carrot soup, so glad that the two got along well. But it didn't have that zippy "oh wow" zing that I got with the crab stack. Our first appetizer: kanpachi slices with yuzu lime, white soy and shiso leaf. Even though I'm on the verge of amberjack-yellowtail overkill (lots of restaurants has been featuring this fish raw as of late -- is this the salmon of the decade? ), it was wickedly delicious. 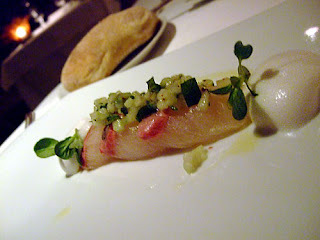 The buttery slices of the fish was nicely balanced with tangy yuzu and the distinct herby, minty note of shiso. Our second appetizer is maine lobster with yellow beets, american cavaiar and tarragon (and I couldn't tell if the golden, translucent slice on top is jellied beets or just plain 'ole jelly). 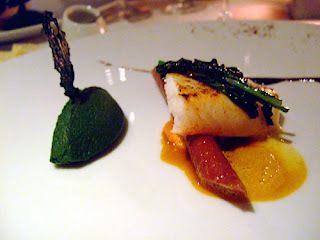 Unique pairing, though for better or for worse, the lobster's taste seemed to be obscured by the tangy-sweet beets, salty caviar and the fragrant tarragon. I am not a big fan of lobster to begin with anyways, so personally I was fine with creative clash of flavors and firm meat. Appetizer three: Nancy Hill's hand-picked diver scallops from Maine, seared, with applewood smoked bacon, hearts of palm, pistachio and star anise gastrique. 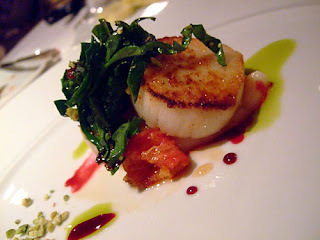 This reminds me of a modernized version of a wilted salad (of course, with more emphasis on the non-greens) - the scallop and bacon is a classic pairing, but the veggies, nuts and sauce definitely elevates it to a higher level - particularly with the fresh crunch of the pistachios and the "greeness" of the leaves. Our first entree-ish plate: John Dory with a broccolini puree, flowering broccoli, purple carrot and carrot butter - another one of those popular fishes that's gotten a lot of play recently; I agree with my dining compadre that the fish itself doesn't have much flavor of its own -- so I'm on the fence about its pairing with other bland-ish ingredients. It lets out what little innate taste of the john dory glisten out, but also misses an opportunity for this nondescript fish to act as a backdrop and soak up stronger tastes. However, given Providence's premise of wanting seafood's fresh naturalness to stand out even in light of all the dressing, I think they made the right call, but wished they picked a fish with a little more character. 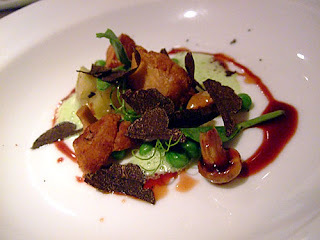 Entree, part deux: Sweetbreads with chanterelles, braised artichokes, black truffle slivers and peas. Oh. goodness. I almost feel guilty saying that this dish is a block (and artery-) busting hit, considering that it's the a non-seafood course (the only one we had during this meal). The crisp fried rich sweetbreads were amazing with the earthy fungi and the slightly-briny liquids from the braised 'chokes! 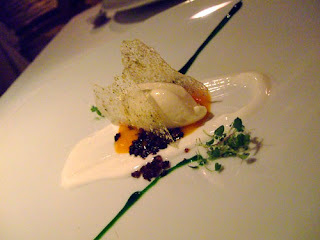 Simply heavenly but too bad it's not on the regular menu, I'd go for this a la carte the next time around! Third entree, British Columbian King salmon (yay for wild!) 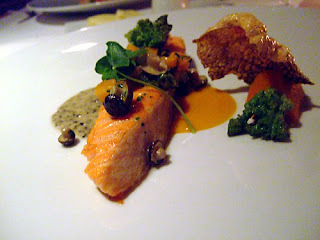 with shimeji mushrooms, black truffle essence, butternut squash with a salmon skin crisp. Comparatively conservative in the flavors, but that's cool with me since this course is solidly delicious. It's hard to go wrong with a nice piece of rich, fatty salmon. Or sweet and substantial butternut squash. The salmon skin chip is a wonderful touch too. 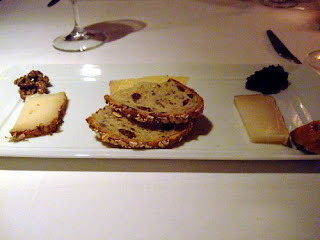 Next up, a cheese plate (one sheep's milk from Spain, a goat's milk from England and a truffle-flavored cow's milk from France) with olive marmalade, candied walnuts, figs and cinnamon-raisin bread. A well-rounded platter with a nice variety of basic tastes, going across the board from the tang of the goat cheese to the slight saltiness of the cow cheese and the sweetness of the accompaniments. Following the cheese platter, we had a freshly dispensed glass of foamy kyoho grape soda with a float of lemongrass/ginger ice cream. Fun to watch as it shoots out of a pressurized can (like the ones used for freshly whipped cream) and fun to drink as the three distinct flavors dance and mingle in effervescence on my tongue. Finishing it all, a white chocolate mousse nestled in white chocolate crisps, encircled by "mediterranean flavors" of yogurt and saffron sauces & olive bits. Definitely one of the more interesting desserts I had in a while; personally, I can do without the olives but otherwise this subtly sweet and very complex dessert is great. 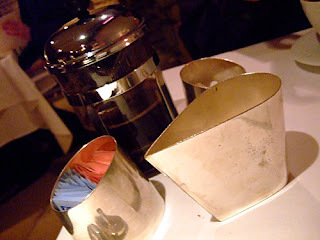 And being the caffeine addict I am, I had coffee with my sweets - served in my very own little french press pot with streamlined silver containers for the accompaniments. The coffee was pretty balanced with a pinch of brightness, so good overall. 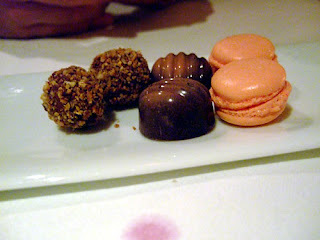 Finishing off the meal, assorted candies and sweets - raspberry macarons, praline marzipan balls, and "rubio" truffles (I'm guessing not the fish taco chain -- and if I had to take a wild guess, a ruby port from how it tastes). Exquisite with the coffee. And so ended my nearly three hour dinner with Providence - very few and very minor hiccups along the way, but in general I'd say it exceed my expectations, and I can't wait to return when I have a special occasion to celebrate. - Be sure to ask about the "worst table" and its corresponding 10% discount when reserving (we didn't, bummer) ~ given the menu's prices (particularly the tasting ones) that's quite a bit of change you'll be saving and the word is the worst table is not that bad. - On its own or along with dinner, Providence also offers a dessert tasting menu, designed by pastry chef Adrian Vasquez, who's been all over the world. Comes in 3- or 5- course versions, along with optional wine pairings. 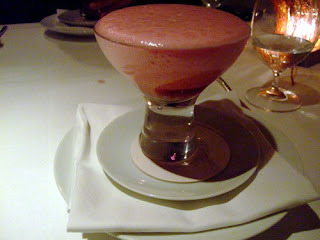 - The cocktails, made with freshly squeezed juices, may be worth a check out too. Mini Foodventure #33: BLD - Better Late than D'oh! Just go and give it a try (whether for the B, L or D -- or maybe a snacky S) - reviews aren't as universally glowing as Mozza, but generally positive -- I personally liked it and so have others. Also a good opportunity to get a taste of Neal Fraser's style before committing to the pricier and more exotic offerings of Grace. I ate during brunch-time on a Sunday. 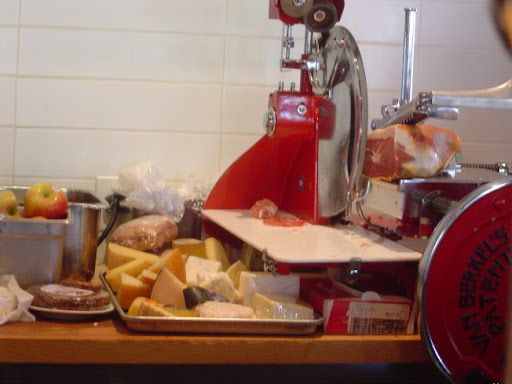 Not having reservations, I opted for a bar seat instead of a table wait -- which gave me prime seating to view (and smell) the crepes being freshly made and the charcuterie & cheese platters being put together. 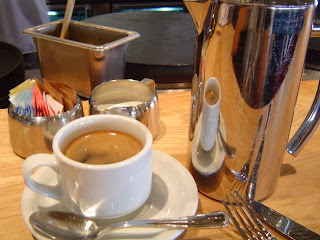 Despite the tantalizing smells, I skipped both the crepes and the cuts and went for coffee and a sandwich instead. The coffee - good and strong, just like Grace's -- really wished I had the stomach for a rich dessert - like the molten cake from nearby Susina's - because this would have been a perfect non-alchy pairing. 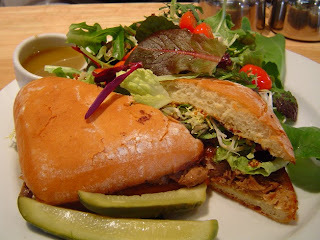 Like Sarah from the delicious life, I had the braised pork shank sandwich. 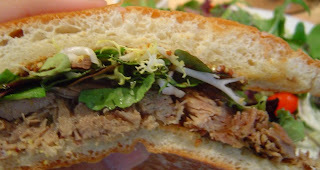 Simply wonderful mix of greens, tart and spicy whole grain mustard, and melt-in-your-mouth tender pieces of pork in a substantial bun. The side salad was fresh and crisp, and the viniagrette delightful. But enough said already for a quickie review; I'll end with a close-up shot. Thanks to heads up from Eating L.A. & LA Eater, I managed to get a sneak peek of Eagle Rock joint Larkin's before its soon-to-come official opening. For a while now, the soul food joint has been doing a soft opening invite-only event (you have to sign up on the e-mail list on their Web site to be in the know.) Official opening was supposed to be this past weekend but it got pushed off for another few weeks "to deal with contractor issues," my waitress told me. 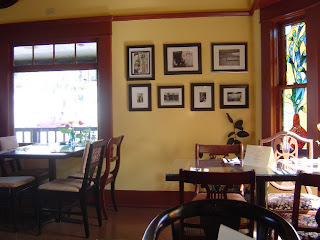 Matching its cuisine, the ambience has a wonderful homely feel with a modern twist. A rustic cottage exterior with lots of potted plants about, and the interior is painted a lovely buttercream with raw sienna accents (see, Mom, I told you that 80-color Crayola crayon set would pay off!) There were also stained-glass windows, complementing-yet-mismatched chairs and provocative photographs of urban Cuba all along the walls. 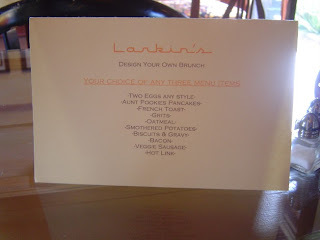 As you can tell from the menu, the brunch items are solid breakfast mainfare (their dinner fare seems to be a better showcase of soul food.) I went for mimosa, well-made by the way, and ordered Aunt Pookie's pancakes (at the eager recommendation of the waitress) along with hot links and scrambled eggs. 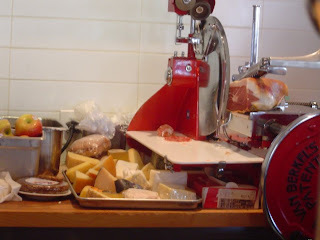 Simply put-everything was simply delish, even though it's nothing fancy. The eggs, accented with parsley and some herbs and spices (the only one that seems to stand out are chives, and I'm not even 100% sure about that), were great with just a dash of pepper. The links had that wonderful pan-fried crispy exterior that oozes spicy juices with each bite. 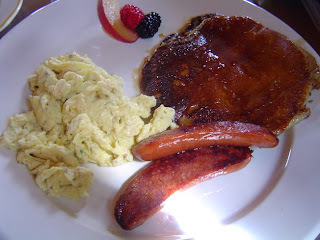 And then, there's the pancakes--sauteed with maple syrup & brown sugar--with a fluffy, bread pudding-like texture and an intriguing combination of flavors from the syrup and the buckwheatiness of cooked batter. 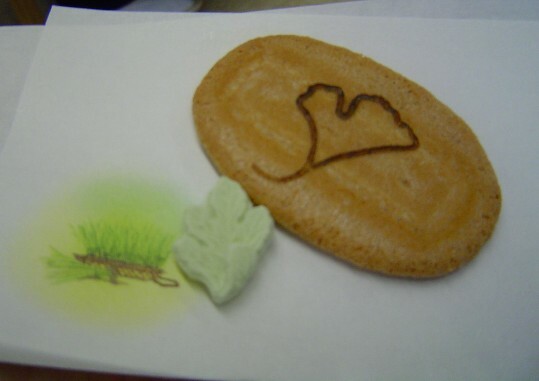 My only advice-eat 'em first and eat 'em fast before the syrup sogs it down. All in all, a very enjoyable experience, though personally I feel the meal's price-point is just a bit too high; I do love the build-your-own menu concept, as much as it would bug an indecisive diner. 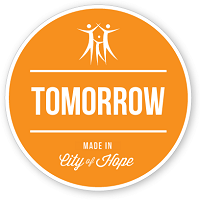 Nonetheless, I can't wait to return for another meal and wish chef-owner Larkin Mackey and partner-manager Joshua McBride the best on their official debut. No longer a FroYo virgin . . . Touched for the very first time . . . I've resisted the call of PinkBerry, KiwiBerry, Red Mango and all the other similar sounding froyo places until now, despite the numerous attention it recieves from Chowhound, LA Eater and of course, shout-outs from Colleen Cuisine -- who'd thought my dining companion who wants to "share a treat" after lunch at the Coral Tree Cafe would do me in? And so, I had my first $5+ frozen yogurt at the PinkBerry on the Sawtelle strip area -- a regular with strawberries, blueberries, kiwi and mini mochis. My opinion? 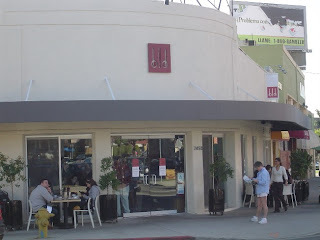 It was good, but I'd still much prefer ice cream from Scoops or Fosselman's, or a good chocolate-hazelnut gelato from Bulgarini when I catch an indie flick from Laemmle Playhouse 7. But to me, that's kind of like settling for a smoothie when I'm craving for a milkshake or a malt. I'd rather bank my calories for the real deal with hot fudge, whipped cream & a pile of nuts. But in the rare instances when I feel like the lighter, slightly tangy taste of a froyo - I'd consider going to pinkberry again. Edit/Update: I really should be more religious on checking out LAT's food section, looks like Bulgarini will be getting a permanent shop in Altadena. Woot!